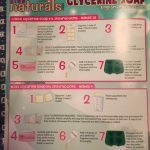 I have to admit that I am not a crafty person nor can I sew a button on a shirt so when I was asked to do a review on the Kiss Naturals Glycerine Soap Kit I can now admit that I was nervous. My saving grace is that I knew my 8 year old son would love doing this DIY kit. We sat down at the kitchen table and I was ready with my iPhone to take pictures. My son Riley immediately posed for the camera (which he never does). The first picture (shown left) was of him ‘showcasing’ the kit. Now to the good stuff: I was pleasantly surprised to find extremely ease-to-use instructions with pictures (see picture right). I quite honestly dislike reading long, drawn out directions…you know the kind when you get a piece of furniture that you need to put together? Not here! Step 1: We removed the large pre-scored bar of clear glycerine soap. It was scored into 8 sections; each section makes 2 mini bars of soap. 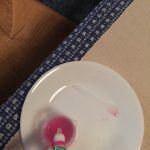 Step 2: We broke off one cube of the soap and placed it in the enclosed measuring cup and placed on a dish in the microwave. As indicated we entered ’10 seconds’ and pulled out the cup. I was surprised all the glycerine soap melted that fast. Step 3: We put a pinch of the powdered coloring (included) and stirred it into the glycerine mixture with a small stirring stick (included). In this kit we were given an aqua color and pink color. These a mica-based colors and look like a sparkling powder. Step 4: We added 5 drops of the fragrance. We were given 2 fragrance oils: ‘Tropical Sunset’ and ‘Jasmine’. We mixed the fragrance into the mixture. Step 5: We poured the mixture into 2 of the silicone molds. The kit includes a silicone mold with 4 cavities. 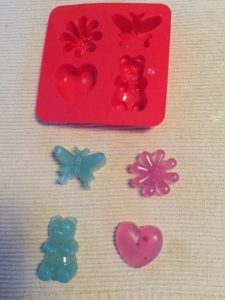 Step 6: We repeated steps 1-5 using a different color and fragrance and poured it into the remaining silicone mold cavities. We started the kit around 7pm in the evening and it took us approximately 20 minutes to do. We let the soap sit overnight (it does harden within 15-20 minutes though). My son got up very early the next morning, as he usually does, and took the soaps out of the mold himself and woke me up showing them to me. “Mom, this is way cool, can we do some more before I go to school?” After he got dressed and ate breakfast we did the process again. It was SO EASY!!! He got on the bus telling me that we need to do more when he gets home from school. The kits will make a total of 16 miniature bars of soap! I loved this set because it was so EASY! I also appreciated that the fragrance oils we not over-powering. You know when you go into a store and you go past the perfume section and you feel like you are going to get knocked over with the scents? Of course you can control how many drops of the fragrance oil you put in the mixture. The only thing I noticed is that the packaging was more targeted towards girls (even though my son didn’t say anything at all). The picture on the front showed a girl and you could see a pink silicone mold through the window of the box. For future marketing purposes I would make the packaging a bit more neutral; but that is just me wearing my former store/business owner hat. I am looking forward to trying more of the kits. Riley expressed interested in the ‘Bath Fizzie’ DIY kit. 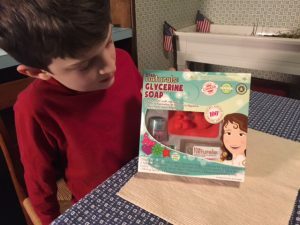 I know if Riley gets invited to a birthday party for a girl I will be sure that he brings the ‘Glycerine Soap’ kit as his gift! 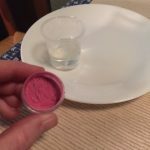 This entry was posted in Blog and tagged kiss naturals, product review, soap making kit. Bookmark the permalink.